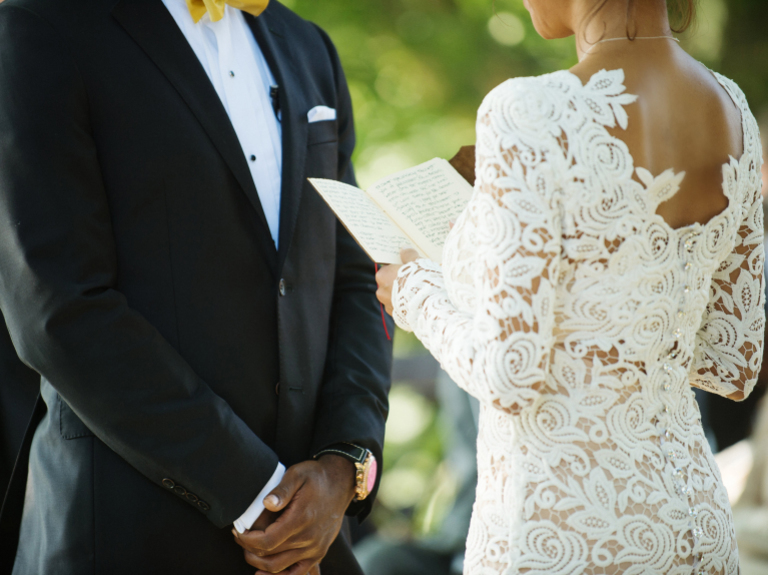 Thinking Of Writing Your Own Ceremony Vows? Read This First. Writing your own vows won’t be easy, but it will be totally worth it when you’re up at that altar. Ready to get to work? Just take it one word at a time. Step 1. Read dozens of vow examples for inspiration. Start by reading traditional, by-the-book vows — from your own religion, if you practice a certain faith, and others, as well — to see what strikes a chord with you. You can incorporate these into the original words you write, or just use them as a jumping-off point for your personalized vows. Once you’ve found a few you love, consider what it is about the style that draws you to those vows in particular. Step 2. Agree on format and tone with your fiance. Decide how you want your vows to come across. Will they be humorous? Poetic and romantic? Go over the logistics too. Will you write them separately or together? Will they be completely different or will you make the same promises to each other, as you would with traditional vows? Some couples do a little of each. Finally, will you share them with each other or keep them a secret until the wedding day? Step 3. Jot down notes about your relationship. What did you think when you first saw your fiance? Step 4. Come up with one or two, or many, promises. They’re called vows for a reason, so the promises are the most important part! A tip: “Include promises that are broad in scope, such as ‘I promise to always support you,’ as well as very specific to the two of you, like ‘I promise to say “I love you” every night before bed,'” says wedding celebrant Christopher Shelley. Step 5. Write it all out. Now that you have notes, it’s time to establish a structure and write your first draft. Speechwriting expert Robert Lehrman suggests a four-part outline: Affirm your love, praise your partner, offer promises and close with a final vow. Another way to organize it is to start with a short story and then come back to it at the end. Step 7. Take out anything too cryptic or embarrassing. You’ve invited your family and friends to witness your vows in order to make your bond public, so be sure everyone feels included in the moment. That means putting a limit on inside jokes, deeply personal anecdotes and obscure nicknames or code words. 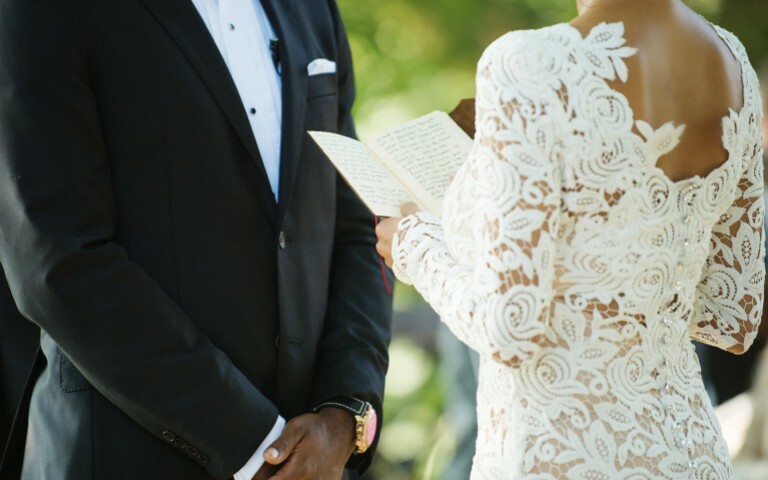 Wedding celebrant and author Maureen Pollinger suggests, “Think about how your vows will sound to you 10 years from now.” Have a friend or family member read it over ahead of time for feedback, if you’re okay with sharing your vows beforehand. Step 8. Shorten your vows to one to two minutes, max. Your vows are important, but that doesn’t mean they should drag on. “When someone says something in a very meaningful way, you don’t have to say it over and over,” Pollinger says. Pick the most important points and make them. If yours are running longer than two minutes, do an edit. Put some of the more personal thoughts in a letter or gift to your fiance on the morning of your wedding and save any guest-related topics for your toasts. Step 9. Practice out loud (seriously!). It might sound weird, but this really is the best way to prep. “When you practice, don’t just do the same thing over and over. Listen each time – then do it better,” Lehrman says. 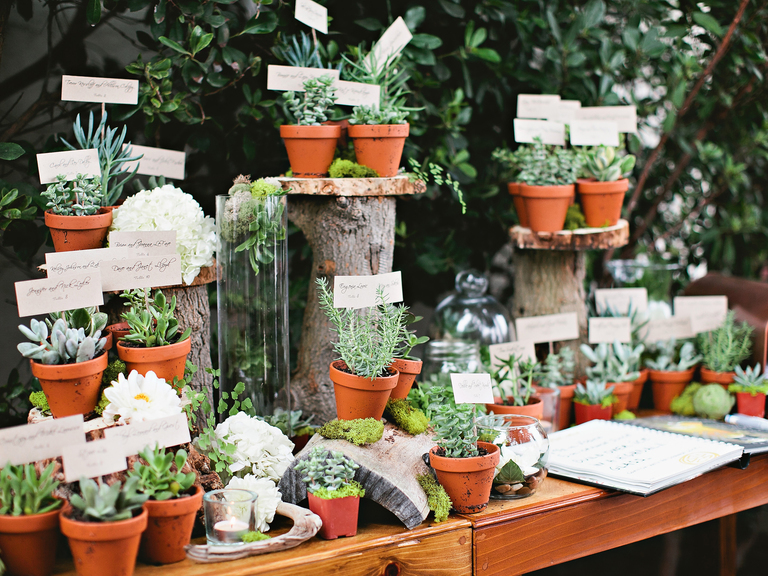 Your vows should be easy to say and sound conversational. As you recite them, listen for any tongue twisters and super-long sentences, then cut them. This is also the time to practice the delivery. “Stand straight, look at your spouse and use your hands expressively – but only use small gestures,” Lehrman says. Step 10. Make a clean copy for yourself. The paper you read from should be legible, so even if you’re working on it right up until a few moments before your ceremony, use a fresh piece of paper free of cross-outs, arrows and notes. And give some thought to the presentation too, because “it will end up in the photos,” says Annie Lee, wedding planner and founder of Daughter of Design. “I suggest a nice note card that matches the wedding colors or a little notebook or pad. You can handwrite it or cut and paste the computer print to fit within that.” And it also makes nice keepsake hang in your home later on. Have a backup plan too. Pollinger points out that some couples find themselves too emotional to speak (it happens! ), so have your officiant either prompt you by quietly saying the vows first or read the vows on your behalf.